In this lesson we will see how to use LiveCode to build a small Word Finder application. This application was originally developed by one of the Development Team to 'assist' him in his Scrabble playing, it's handy but perhaps not strictly within the rules of the game. 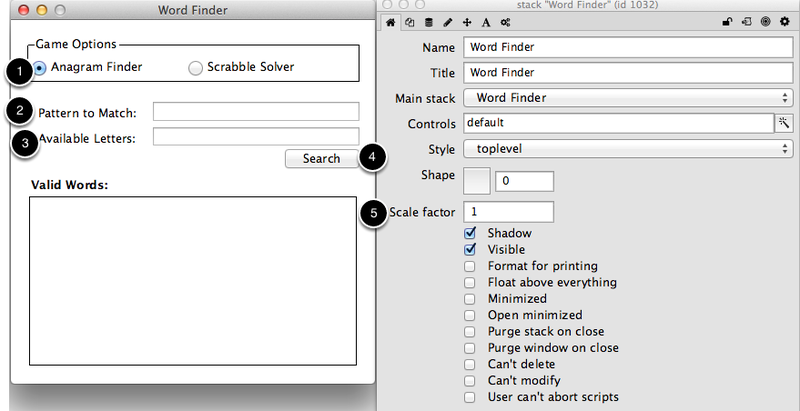 The LiveCode Word Finder has two options; an Anagram Finder and a Scrabble Solver. The Anagram Finder takes a list of letters and returns all the valid anagrams which can be created using them relative to a fixed list of words. Each anagram is checked for validity against the SOWPODS word list which is the word list used in current International Scrabble Tournaments. 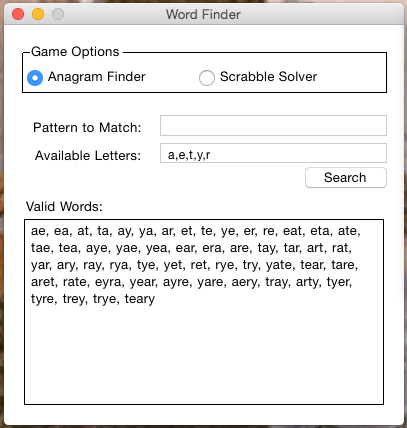 The Scrabble Solver extends the functionality of the Anagram Finder by filtering its results to find only the anagrams which match the user entered pattern. This pattern represents an opening on the Scrabble board where, for example, the pattern 'b??' means find all three letter words starting with 'b'. Question marks must be used to represent wildcards. Only anagrams which contain the same number of characters as those in the pattern will be returned. Firstly we need to create our interface, we need options for what task we want to perform(1), fields to enter the pattern to match(2) and available letters(3), a search button(4) and a results field (5). We group the radio buttons for Anagram Finder and Scrabble Solver, this means only one can be selected at a time without you having to implement that behavior manually. The Word Finder is implemented using one recursive function, which makes up the backbone of the application, and a handful of smaller, simpler functions which perform various checks and preparation work. We begin by generating a list of all possible permutations using the letters which were entered in the Available Letters field. This is done using a recursive function which continually splits the string of available letters down into smaller substrings, and calls itself again with a substring as the parameter. The recursion stops when the parameter string contains only one character and therefore can't be split any further. As the recursion is taking place lists of permutations are generated by placing the characters which have been taken off the start of the parameter string, in turn, between each of the remaining characters of the string. More details can be found by looking at the permuteSequence function in the card script. You can view the card script at the end of this lesson. This will be true if tString is within the word list, and empty (i.e. false) otherwise. This check is much more efficient than checking the lines of the custom property as it can be carried out in constant time. Any permutations which are contained within the dictionary are added to a list of valid words. The final piece of processing needed is to remove any duplicates from this list of words. A duplicate can occur if there are multiple instances of a given letter in the Available Letters field since each letter is treated uniquely in terms of producing permutations. 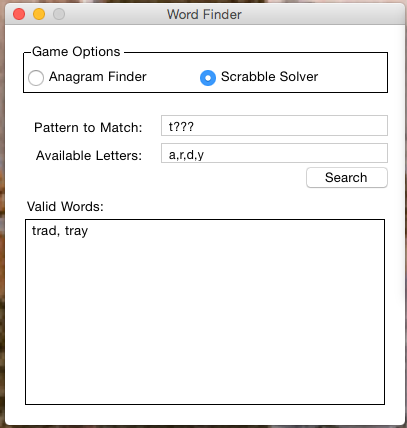 At this point the remaining words will be returned if the Anagram Finder option has been selected. If you selected the Scrabble Solver option one more step is needed before returning the results. This step further filters the list of anagrams to cut out any which do not match the pattern which the user entered. It is implemented using the filter command and takes the contents of the Pattern field to use as the regular expression. Question marks must be used to represent wildcards, for example the pattern 'a?' returns all valid 2 letter words starting with a. In the example above this is aa and ab. This is the list of valid 2 letter words beginning with a which can be made with the given letters, in this case aa is possible because we assume that the a given in the pattern is already on the board and the second a comes from the list of tiles we have in our hand. If you are using the Anagram Finder at least one character must be placed in the available letters field. The returned anagrams will contain only the characters which you enter. Clicking Search will start the application and cause any results to appear in the field below the button. When using the Scrabble Solver both a pattern and list of available characters are required. The characters represent the tiles you currently hold and the pattern an opening on the board( i.e. t *blank slot* *blank slot* *blank slot*). Blank slots (i.e. wildcards) must be entered as question marks and will be interpreted as spaces which need to be filled by one of your tiles. Once you have entered both a pattern and your tiles click Search to retrieve word suggestions. An example of a valid search is shown in the screenshot. put empty into field "Pattern"
put empty into field "AvailableLetters"
put empty into field "Results"
#  and return only those present in the dictionary. -- Filter out any words that do not match the pattern. #  items by word length, formatting appropriately. #  Get a list of all possible permutations. -- one permutation of one letter (obviously!). --  If theres only one character there is only one way to write it. -- Iterate over the characters within the current string. -- Get a substring to make up the start of the permutation. -- Get a substring to make up the end of the permutation. -- Put the first character between the substrings. Prev: How do I Store an Array Variable Inside of Another Array Variable? Thanks for bringing this to our attention. I have updated the attached stack with a uAllWords property compressed within LiveCode and that seems to resolve the issue. Please let us know if the updated stack still can't decompress the data on Windows and Linux. As far as I can tell, everything appears to work correctly now. Thank you for fixing the issue so quickly! # and return only those present in the dictionary. How do I Locate Scripts or Custom Properties in my Project? How do I get the path to common folders on my computer? How can I get the path to the folder a stack file resides in? What Are The Alternatives To Using Global Variables? How do I Create an HTML E-Mail? How do I Attach a File to an E-Mail? How Do I Upload an Extension to the Extension Store? How do I Display Tab Delimited Text in a Table Field? How can I search delimited data for a matching string? How do I style paragraphs in a field? How do I display a table in a field? How do I use hierarchical list support? How do I import a text file? How Do I Process a Binary File? How do I rename the headers on a text file? How do I export a csv file? How do I get the content of a URL on a web server into LiveCode? How do I save custom properties in a standalone application? How do I define my own properties for an object? How do I display an array in a table field? How do I convert tab delimited data into an array? How do I sort an array? How do I add keys to or delete keys from an array? How do I rename a key in an array? How do I store an array in a text file and then retrieve it again? How do I Search an Array? How do I Display an Array in Human Readable Form? How do I Store an Array Variable Inside of Another Array Variable? How do I Create and set up a Database? How do I play sound files in HTML5? How do I Create a Color Picker Swatch? How can I restrict an answer file dialog to just applications? How Can I Pass Data To and Get Data From a Dialog Window? How do I Create a Modal Dialog? How do I use the Project Browser? How do I create a scalable UI using graphics? How do I Send Messages During A Drag Operation? How do I populate a field when an option menu is changed? How do I scroll a card that is taller or wider than the window? How do I use the same controls on multiple cards? How do I use a Progress Bar? How do I move between cards in my stack? How do I Create an ANSI Font Menu? How do I add another card to my stack? How do I display a PDF in LiveCode? How do I Create Animated Overlays? How do I add Motion to Animated Overlays? How do I create and move graphics in an app? Vision: How do I Threshold an Image? Vision: How do I Blur an Image? Vision: How do I Edge Detect an Image? Vision: How do I Convert a Color Image to Grayscale? How do you embed an image in a stack so a path reference is not needed? How do you display an image by dragging it on to a stack? How do I add a custom SVG to use in my app?